Rundholz is known for their unconventional, daring, and whimsical designs, which nears a maximalism style. This edgy and experimental style is juxtaposed but seamlessly blended with the leisurely minimalistic design of Album di Famiglia. The Album di Famiglia ochre yellow cotton top becomes solid base for the bold print mixing of a Rundholz. 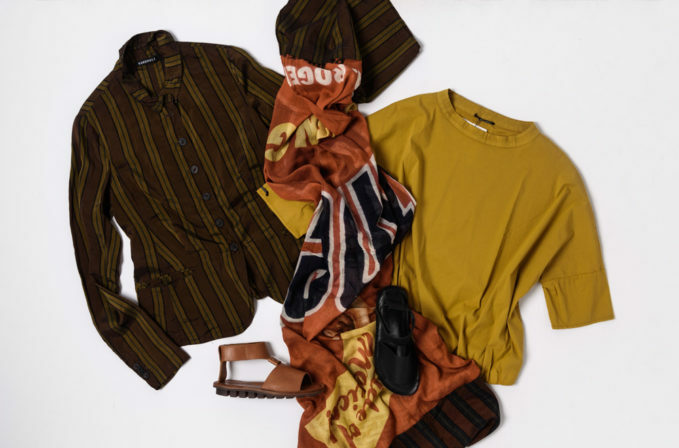 The Rundholz olive and brown striped top with the Rundholz multicolored vintage print scarf has similar browns and yellows. This casual avant garde cotton ensemble is finished with a pair of Trippen black or brown leather sandals.